This is the week of birthdays at my house, there are 4 of them in my family and 2 with my friends.........so it is gonna be a busy one. I whipped up a quick card for my friends son, with Core'dinations and Echo park I love this little boy collection it is perfect for all sorts of things. Tonight I am up to my eyeballs making fondant for the multiple cakes I will be making this week. I promise that I will share photos of that too, but today it is a quick post before the chaos!!!! 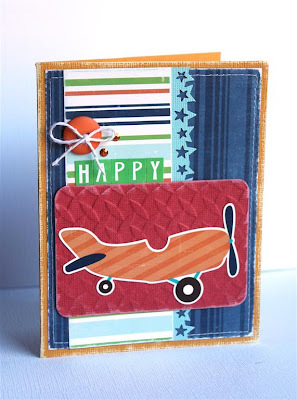 love the texture behind the plane; darling! Your card and layouts are fantastic. Each one is such a pretty page, what a great keepsake scrapbook you must have.